Learn how to use LinkedIn to build a unique methodology, combining the best traits of several sales strategies. Have you ever practiced PUCCKA? Bantered with BANTE? No, these aren’t the latest fitness techniques for getting in shape – they’re sales methodologies. Each plan is a different take on the selling practice – and in some cases, they can be combined to create new plans. In his 2003 book “The New Solution Selling”, Keith M. Eades argued for a modern take on the long-established practice of selling to the solution. Alternately, PUCCKA and BANTE are plans derived from the common pain points found in the sales process: budget, insights, timelines, etc. In “The New Solution Selling, Eades sought to revitalize the concept of solution selling, which has existed since 1983. Selling to the solution is a common sales tactic, though today’s sellers have adapted the practice to the modern buyer. The original premise of solution selling involved the salesperson as an “expert,” while the customer needed to be educated on the solution. The buyer has much greater control today, and this requires a new style of solution selling that has evolved to include insights into industry trends and concerns. Eades himself recognized this trend, publishing a recent book that tackles collaborative selling in a buyer-driven world. Build credibility in the market by providing insights via LinkedIn Groups, the Publishing Platform and on prospect Company Pages. Increased awareness and credibility within Linkedin will translate to more profile views and connections. Track news mentions through LinkedIn’s integration with Newsle. This will help identify what pain points are being addressed in real-time, which allows sales reps to adjust their solutions to fit current discussions. Coined by American entrepreneur Mark Suster, PUCCKA stands for Pain, Unique selling proposition, Compelling event, Champion, Key players, and Aligned purchasing process. PUCCKA attempts to touch on every significant issue or event that might define a sales campaign. One of the main pillars of the PUCCKA process is aligning your purchasing process with customer needs. This approach indicates that reaching out when the customer isn’t interested in buying can damage the sales relationship, and limit the effect of future attempts. It doesn’t have to be a guessing game with customer needs. Thanks to social media we have a window into what those needs are, how customers are defining them, and what messaging styles best encourage them to engage with sales reps. Ask open-ended questions to several prospects within a public group in order to identify real-time concerns across several organizations. If a specific pain point is echoed within numerous business groups, it’s an opportunity to refocus efforts on that issue. Identify the “Champions” at your prospect company, and set up status alerts for their actions within LinkedIn. These people are most likely to make a purchasing decision, so updated alerts will help catch any activity that suggests intent to buy. Developed by Canadian business development consultant Corey Eastman, BANTE condenses some of PUCCKA’s points and highlights the five major factors that influence high-quality sales: Budget, Authority, Need, Timeline, and Evaluation Criteria. Eastman notes that, like PUCCKA, BANTE aims to “gather as much information as possible to ensure you are well positioned for success during the lifecycle of the sale.” Prospect research is essential in the social era, and reaching out without applicable insights risks losing trust with the contact. The success of BANTE relies on having enough information to convince prospects that you know what you’re talking about. Identifying common connections through the new Sales Navigator’s Lead Recommendations, which are tailored to specifications that you define, i.e. roles, functions, etc. Building a database of leads that are already aligned with your priorities will keep your efforts focused on the right audiences. Document the people that prospects engage with on LinkedIn. Are they competitors or co-workers? Industry experts or entry-level apprentices? If prospects are consistently sharing content from specific sources, they’re openly acknowledging the value from those sources. Try sharing content from those same sources, along with some additional insights that can start new conversations. 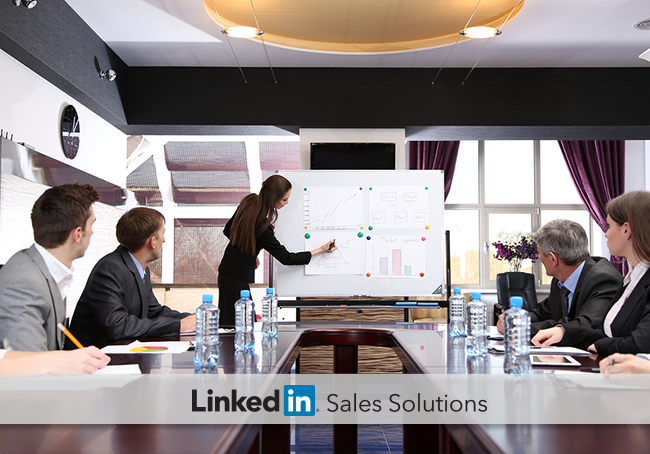 Solution Selling, PUCCKA and BANTE each have distinct traits that can be utilized in a LinkedIn-specific sales methodology. Try molding your own methodology with LinkedIn and the new Sales Navigator, and share your experiences with us @LinkedInSelling.